The Hoosier Salon 2017 Annual Exhibition (the 93rd) is moving to the Indiana State Museum. The museum hosted the longstanding Indiana art tradition from 1990 to 2011. The Hoosier Salon’ new five-year agreement with the museum showcases both organizations’ commitment to presenting the best of Indiana’s artists. The decision to move came about as the previous five-year agreement with the Indiana Historical Society ended in 2016. “We were quite content with our successful partnership with the Indiana Historical Society and could have remained there indefinitely,” said James May, executive director of the Hoosier Salon. However, after being approached by the museum, the Hoosier Salon’s board of directors opted for the larger, more flexible gallery space offered at the museum. “The Hoosier Salon is diversifying our membership – welcoming new artists working in new media. The Indiana State Museum offers us greater ability to include more three-dimensional media and more room to grow,” said Marilyn Shank, president of the Hoosier Salon board of directors. The 93rd Annual Hoosier Salon Exhibition opens to the public at the Indiana State Museum on July 27, 2017. The juried exhibition of recent art by Indiana’s best artists will remain on view through October 8. 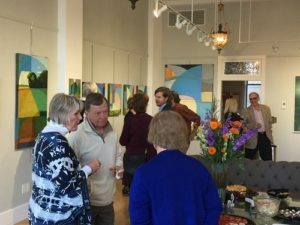 The Hoosier Salon is a statewide nonprofit artist-service organization based in Indianapolis with galleries in Carmel, Indiana and New Harmony, Indiana.